Glaucoma is a condition that damages the eye’s optic nerve and steals sight without warning. The optic nerve carries the impulses formed by the retina, the nerve layer that lines the back of the eye and senses light and creates impulses. These impulses are dispatched through the optic nerve to the brain, which interprets them as images. Optic nerve damage in glaucoma is primarily due to elevated intra-ocular pressure (IOP) within the eye. 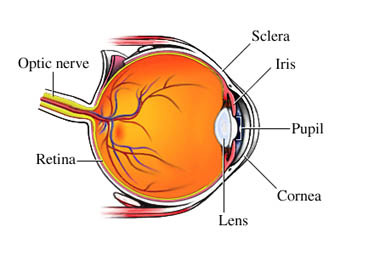 Open-angle glaucoma ( 90% of all glaucoma cases) has a wide and open angle between the iris and cornea. It is caused by the slow clogging of the drainage canals, resulting in increased eye pressure. Open-angle glaucoma develops slowly and is a lifelong condition and has symptoms and damage that are not noticed. There may be few symptoms or no symptoms at all of glaucoma in the early stages of the disease. The very first sign of glaucoma is often the loss of peripheral or side vision, which can go unnoticed until late in the disease. Identifying glaucoma early is one reason you should have a complete exam with an eye specialist every one to two years. Sometimes, intraocular pressure can rise to severe levels. In these cases, the appearance of halos around lights and blurred vision, vision loss, sudden eye pain and headache may occur. An ophthalmologist will test your vision and examine your eyes through dilated pupils. The doctor will also perform a procedure called tonometry to check for eye pressure and a visual field test to determine if there is loss of peripheral vision. At this time, loss of vision caused by glaucoma is irreversible and cannot be restored. However, successfully lowering eye pressure can prevent further visual loss from glaucoma. Most people with glaucoma do not go blind as long as they follow their treatment plan and have regular eye exams. Early diagnosis and treatment is the key to preserving sight in people with glaucoma.